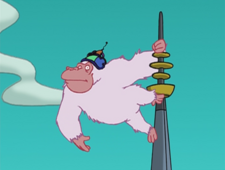 The Albino Shouting Gorillas are gorillas created by Professor Farnsworth that are used to shout his love to Mom on rooftops. They are activated by a remote control and can only say 'Love Mom'. Gorillas: Love Mom! Love Mom! Love Mom! This page was last edited on 21 April 2010, at 13:00.